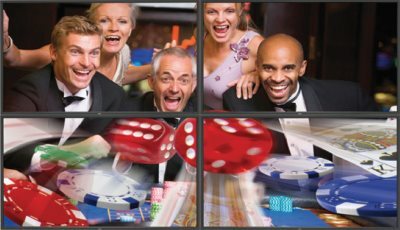 Large format LCDs for casino displays. Hit hard. Win Big. Players come to your casino to catch the action! Nothing hits them harder than big league video displays from JCMedia. With every conceivable display configuration from giant, super hi-def sports book screens to personal service kiosks, nobody offers you more display choices, and more ways to create and control your marketing content. In today’s challenging environment, getting your message to your players is essential to maintaining your competitive advantage, and digital displays are an excellent way to attract their attention. JCM is proud to offer a wide range of LCD and plasma monitors that are perfect for your in-house marketing, advertising and other critical messages. We offer a wide range of reputable, commercial quality displays made by well-known manufacturers like Samsung, LG, Philips and more, and our direct access to these brands ensures that you have access to the best pricing available. To learn more about how JCM can help you enhance your in-house media needs, contact us today.